This Christmas was filled with lots of lovely outdoorsy gifts. I am always amazed by the G-Force’s ability to remember hints – and kit mentioned – over the space of six months (from my birthday in May to December)! My favourite outdoors products this year include a head torch, GPS heart rate monitor and a bike accessory gadget. And the top product from these has to be the Silva head torch. I know it might seem a bit odd to be excited by a head torch but I have tried so many and never found one that really does the job. I want a head torch that I can use for running and so it needs to be light, small, andneat but still very bright. I have found bright head torches that are too big and unwieldy for comfortable running. I have had tiny head torches that are comfy to wear but just don’t light the way on a dark winter’s morning or evening. Then, I spotted the Silva range of head torches. I thought Silva made only compasses, but not so. They also make an amazingly wide range of head torches including such beauties (oh, I know it’s strange to love head torches!) 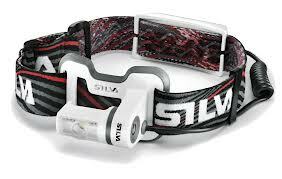 as Silva Trail Runner II Headtorch, the Silva Simi Bike Light and Silva Runner head torch. Being a generous sort, the G-Force bought me one of their pricier head torches, the Silva Trail Runner Headtorch. And it’s awesome! 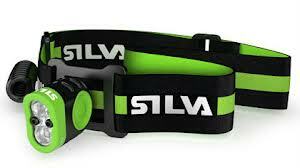 The Silva Runner is an extremely lightweight and compact headlamp with an amazing light output. The high power LEDs provide “Silva Intelligent Light”, which means that one LED is a spotlight for distant vision, while the other is a floodlight for peripheral light. That makes huge sense for running on rough terrain where having an even pool of illumination makes it far easier to place feet precisely. It also means you can see ahead – and also look at your watch (I do a lot of reps running) on your wrist. The torch comes with an external rechargeable battery pack, which I’m not so fond of because you need to find a place to carry it and sort all the wires in between but I’m not going to complain too much. The battery pack is, in fact, small and lightweight and I found it stayed in place when I popped it inside the waistband of my running tights. It would also fit in a pocket, a rucksack or you can attach the battery pack to the headband. And a few words about the head band. The wide headband is the most comfortable yet neatly fitting I have ever used. There is no “over the top of the head” strap to annoy you or cause the torch to pop off your head. The torch stays in place and almost blends to your head. I also found I could switch the head torch on and off without removing my gloves. This is an important asset on a winter’s evening. As I said I am unusually excited by such a simple thing as a head torch but it really is a joy to find a piece of kit that does a job so perfectly. Running on winter evenings is now so much easier with a torch that lights the way ahead as if it were daylight. The cheapest I have seen the Silva runner on-line is £136 from Simply Run. For another less pricey version that relies on AA batteries rather than a rechargable battery pack try the Silva Trail Runner Headtorch sold at Cotswold Outdoor. A friend recommended this version, too. Useful review Fiona. I looking for a headtorch for my husband for Christmas. I think you know my sister Susanna – I have your name on some of her Facebook posts. the internet is an amazing thing!! Glad I could help! Silva have just brought out a new lightweight trail runner. I will be testing so you can expect a review in the New Year. Is it Susanna Edwards? Your sis? She is lovely! I know her through my tri club pals. Solid tips Fiona 🙂 My girlfriend and I have been looking for a proper head torch each for a while now. But we don’t want to spend more than £50! Is it possible?! Hmmm… that is a toughie. Let me see what my Facebook followers suggest. Sometimes it really is a case of spending more to get a fab item. I find them better built than many more expensive options – been through Petzl, Black Diamond and Silva over the past few years. Ps they currently have a sale on online. and another: Alpkit Gamma is awesome and only £15 from memory.